Our Custom Molded Tokens are a perfect way to create Game Pieces that have any design(s) you choose! Your unique Game Piece designs will be embossed right into the Game Tokens. 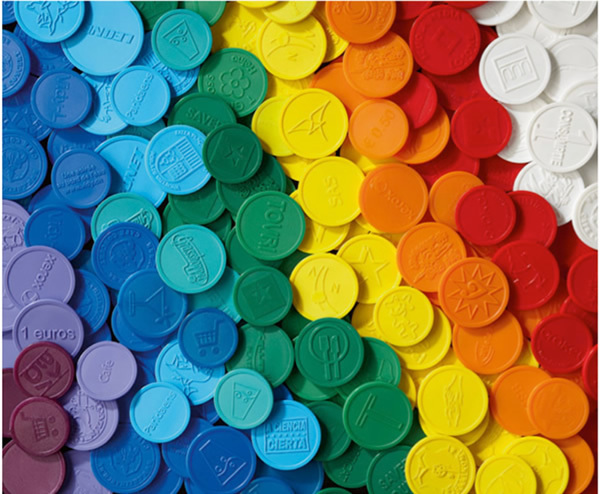 Molded / Embossed Plastic Game Tokens are available in four round sizes –15/16", 1", 1-1/8", and 1-3/8" (all 1/12" thick) – as well as in a hexagon shape. The minimum order for Custom Molded/Embossed Tokens is only 1,000 pieces! Molded/Embossed Plastic Game Tokens come in the following colors: Black, Dark Blue, Light Blue, Dark Green, Light Green, Gold, Orange, Day Glow Pink, Purple, Red, Turquoise, White, and Yellow. You can even split your order among various Molded Token colors (additional charge applies – see chart below). The minimum order for Molded / Embossed Plastic Game Tokens is only 1,000 pieces. Production time is about three weeks after proof approval.